2018 NRA World Shooting Championships an AMAZING SUCCESS! Great turnout and great weather for the World Shooting Championships. Here's some pics from the event! Going to the World Shooting Championships ? 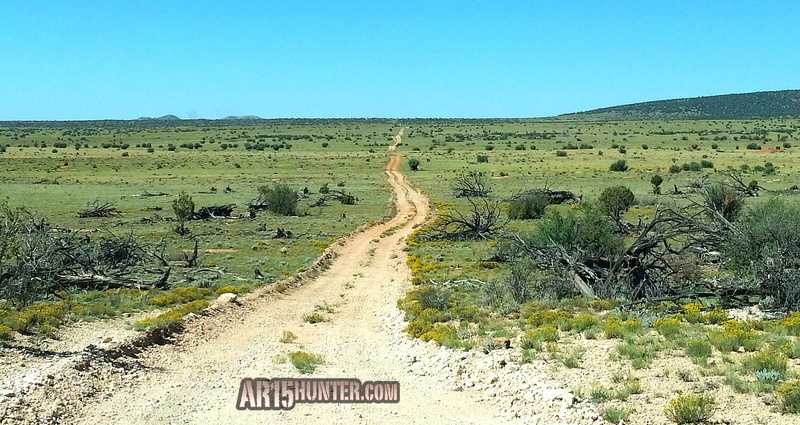 If you're a shooter, you'll be shooting Australian Outback Ammunition in stage 1. Australian Outback is a proud sponsor of the NRA World Shooting Championships for 2018. Just attending? Stop by our display for a chance to win a HUGE PRIZE from Australian Outback Ammunition. 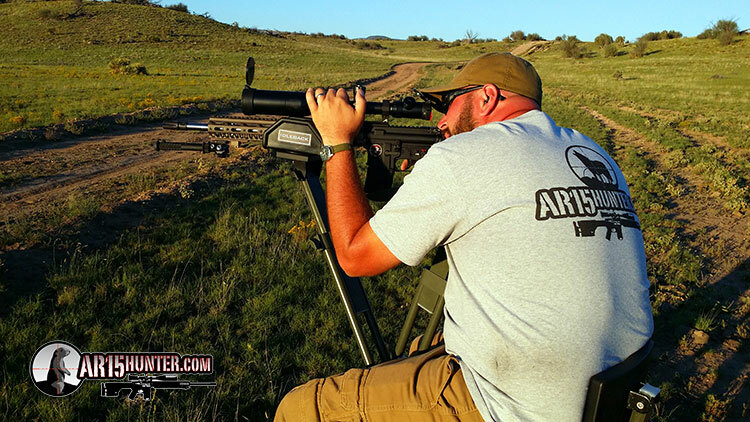 Read what they're saying about AOB Ammunition and watch the Videos on this incredible ammo. The skies were a beautiful mix of sunshine and rain clouds as we drove towards Flagstaff for a week long prairie dog hunting trip in northern Arizona. The weather wasn’t looking good, thanks to the recent hurricane that had hit the gulf coast. However, our hopes were high, and I was itching to get some more real world results with Australian Outback’s .223 55gr BlitzKing ammo. We already published our Range Report, and I already smacked a nice ground hog with this load at 205 yards back in Ohio. However, now I wanted to try my hand at taking some of the ground hog’s smaller western counterparts, at even greater distances. I was looking forward to my first prairie dog hunt and my excitement was building. We arrived in Flagstaff during the mid afternoon on Sunday, and as soon as we dropped our bags at our hotel, we proceed directly to “the pit” to verify our zeros. While our rifles had already been zeroed before we hit the road, we wanted to ensure that there wasn’t any POI (Point of Impact) shift at this high elevation of approx. 8000 feet. Due to the rain coming in and out that day, we didn’t get to zero, however we did see something of interest; rock squirrels. Lots of them! The next morning we met with a good friend that is local to the area to setup our game plan for the day’s hunt. The weather outlook was still bleak, but we were hopeful that it would dissipate as the day progressed. After an early breakfast, we headed back to the pit to reaffirm our zeros, and see if our squirrel friends were still out. To our surprise, the rain let up, and after a quick sight-in session, the squirrels started coming out in full force. With my ballistics cheater chart taped to my A2 stock, I started to set my sights on some of the small Northern Arizona rock squirrels, which look very similar to the ground squirrels we saw in California. My first shot was on a squirrel at about 50 yards, who was hiding in some rocks. Because only his head was showing, I had to thread the bullet in between some rocks to make the shot. I took my time, trying to contain my excitement, and squeezed the trigger. What we saw was a puff of dust from the rocks and we thought it was a miss, since we couldn’t find the body or any trace of blood. The video we captured, however, revealed that it was a solid hit, that launched the squirrel about 5 yards away from where I was searching. The next shots I took that morning were at a couple of squirrels way up on the top of a hill, about 115-120 yards away. I lined up the first one and took a shot; miss! I lined up the second, and another miss! As I gathered myself I realized I was holding too high. When I looked at my ballistic cheat sheet, I remembered that at 100 yards the Australian Outback 55gr load was hitting about 1.9-inches high from my 50 yard zero. While on mid sized game that small amount of deviation is not enough to cause a miss. However, on these small squirrels it was. I took those two shots as a learning experience, and began to glass around. Not long after, one of the squirrels I had missed earlier came around a large rock to nibble on some foliage. He was just to the left of my first two misses, so I knew right where to hold this time. I got him in my sights, putting the crosshairs down by his feet. I slowly squeezed my trigger, and as soon as I heard the report from the rifle I saw the 55gr BlitzKing smack the squirrel with impressive results, all on video. We ranged the shot at 115 yards. As time went on Eric was able to take several squirrels with the Franklin Armory F-17L, and I was able to tag one more at about 80 yards. Again, the Australian Outback load was precise, and devastating to this little guy. After a few hours of fun at the pit, we decided to pack up and journey north to see if the weather was going to cooperate with us for some prairie dog hunting. Days one and two of our prairie dog hunting started with some rain and a good amount of wind. However, bound and determined to get some dogs, we drove until we had a break in the weather and found a nice honey hole with the sweet sound of prairie dogs “barking” all around. 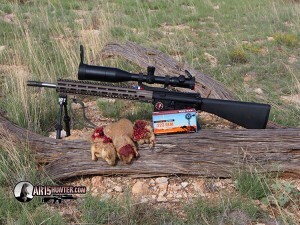 The Australian Outback 55gr BlitzKing load did well both days, tagging various prairie dogs from 100 yards on out. That projectile coming out of my 18″ barrel at approx. 3000FPS performed well on the prairie dogs, leaving no doubt that the shots were solid hits and that the bullet blew-up the way it was intended. 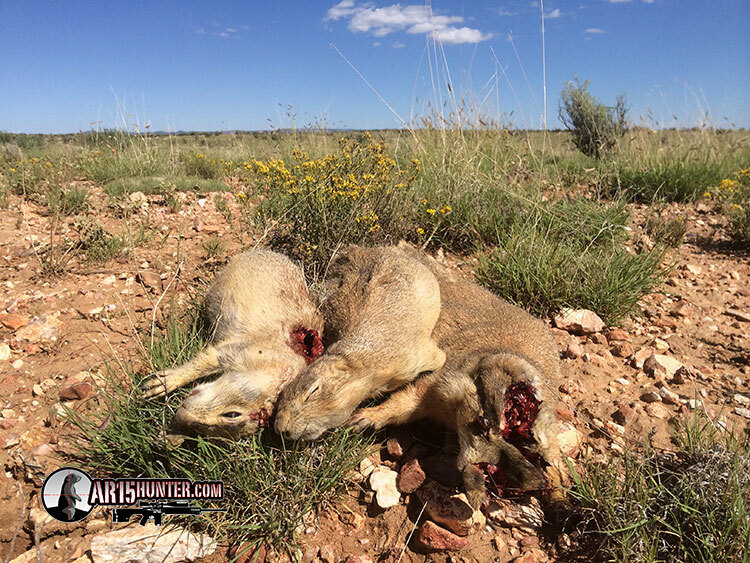 With several head shots, including our furthest shot of both days at 281 yards, as well as some explosive torso shots, the Aussie ammo wreaked havoc to the dogs that ended up in my crosshairs. So long as I did my part with doping the wind and getting a solid range estimate, the ammo did its part to quickly dispatch the dogs. Most all shots produced DRT (Dead Right There) results, which is what we strive for. While we enjoy hunting these nuisance animals, we don’t like to see them suffer. For the remainder of our trip we were down in the open desert and prairies to try for some long range shots with the Aussie ammo. 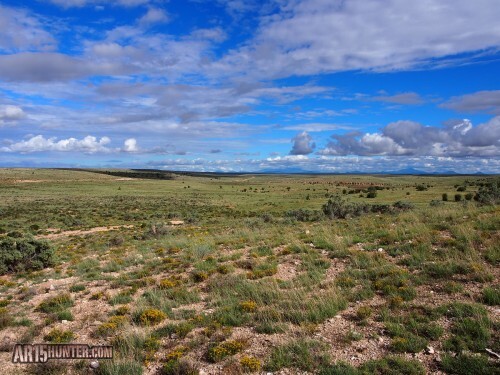 The weather had moved out, and we were in for two days of the most perfect weather a varmint hunter could ask for; nice and sunny with little to no wind. We traveled several miles through the desert, searching for a large population of dogs. As we crested the top of a small hill, we came upon a valley that was just loaded with prairie dogs! 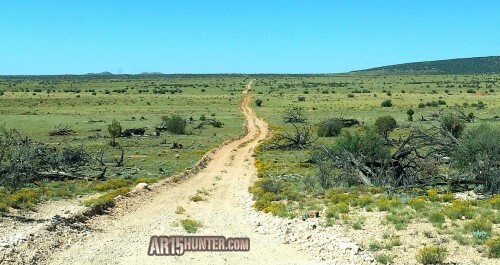 It was like a scene from an old western movie and it was the perfect place to push the limits of this Aussie ammo, and my marksmanship skills. Performance results of the Aussie Outback Ammo! The first two days of the trip I spent most of the time laying in the dirt shooting from the prone off of my Atlas bipod. Now that we were in a desert environment, I decided to give Eric’s Idleback Shooting Chair a try (which I’ll be writing up a gear review on in the coming weeks). Eric and I got setup on a small clearing at the top of the hill, which gave us a good vantage point of the entire valley, with holes as far as the eye could see. We started ranging landmarks to get an idea of the distances we’d be shooting and the general range of opportunity was 250 yards out past 400 yards. The first day atop this hill proved to be bountiful, with Eric and I tagging dozens of dogs. Up until this point, our longest kill had been 281 yards. I bested that with a confirmed kill at 352 yards. 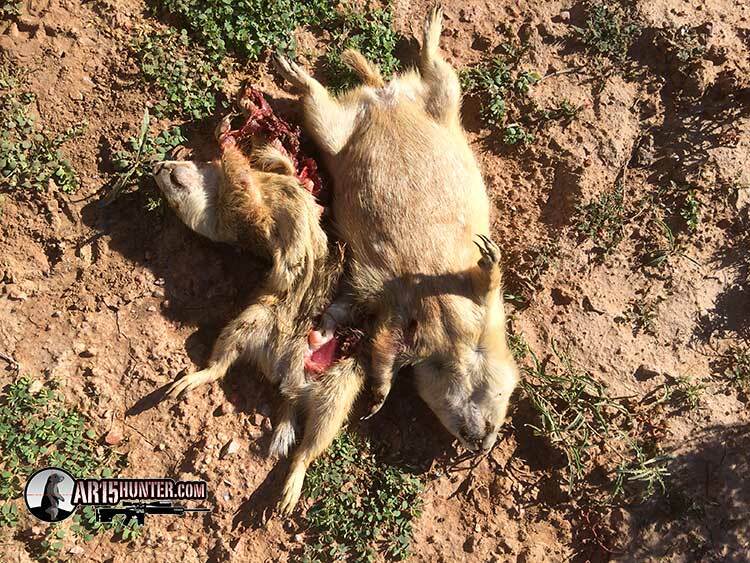 Again, the Australian Outback Ammo produced a DRT result with annihilating results on the prairie dog. There were several instances where this ammo almost blew dogs in half. While this location proved to be quite good, we decided to move further down the road to check out some other spots, as well as do some predator calling. What we found was another prairie dog honey hole, which provided some awesome results for me the following day. Day two in the valley came on September 11th. While this is a day we will never forget due to the attacks on our nation, I had no idea it would become even more important to me as the day went on. We ventured back to some familiar spots and took various dogs from as close as 50 yards to about 200 yards. Each time the Aussie ammo swiftly dispatched the intended target. Later in the afternoon we moved to the above noted honey hole and setup for some more long range shots using the Idleback. The prairie dogs were everywhere (be sure to check out our YouTube video) and we both killed various dogs, shooting mostly at the 250-275 yard range. I then focused my attention to the left of the area we were shooting, towards a bush we named the “tunnel bush”. It was there that I found some long-range, prairie dog shooting action. We had ranged the tunnel bush at 411 yards, and there was a ton of activity around and in front of it. One large prairie dog stood out from the rest and I threw 1.4mils of elevation on my gun to reach out to 400 yards. I took the first shot, which looked and felt good, but it was high! I quickly realized a fact that I learned early on during this trip, our rifles were shooting much flatter than expected at this high elevation. With that fresh in my mind, I quickly adjusted my elevation turret, and lined up the next shot. HIT! Even Eric was excited as he yelled, “Oh, you got him!”. This is a situation that shows how having a semi-automatic rifle can really improve a hunter’s ability to harvest game. Being able to quickly send follow-up shots increased our success rate, and even allowed for some doubles. While we thought we had just smoked a dog at over 400 yards, we soon learned it was ‘only’ 372 yards. You see, one of the deceiving things about shooting out in the desert is distance. Objects that looked to be right next to or behind a prairie dog were sometimes 30-50 yards away. As we walked towards my new personal record kill, we noticed that he was about 40 yards in front of the tunnel bush. When you watch our video, it still looks like he’s a lot closer than he was. Either way, even at 372 yards, the Australian Outback 55gr BlitzKing load still had enough energy to blow him apart, which was quite impressive. Not long before that amazing shot, I learned why September 11th, 2014 will be a day that I will always remember. It wasn’t just because of this awesome trip and that long shot, but because on that day I lost someone very special in my life. My Grandfather, Merwin Chambers, went home to be with the Lord at about 4PM ET. It was tough, being so far away and losing someone I loved so very much. However, my Dad assured me that he had shown my Grandpa some of the pictures from our trip, and he told me Grandpa was proud. You see, he too was a hunter, and seeing his grandson doing something he loved made him very happy. So, at that point I dedicated this trip to my Grandpa. May you rest in peace, I love you! The trip came to an end far too quickly, however Eric and I had a blast. Reflecting on our trip and my shots, I was very impressed with the performance of the Australian Outback .223 – 55gr Sierra BlitzKing loads. They flew extremely well and were very consistent. As long as I did my part, the rounds hit where they were supposed to and the results were stellar on every game animal I took, from an Ohio ground hog to Northern Arizona prairie dogs, and even a huge jackrabbit. I have no hesitation recommending this ammo to anyone who’s serious about hunting varmints to mid-sized game. While we were not lucky enough to call in any coyotes or bobcat, I have no doubt in my mind that this load would have the energy necessary to take either, even at longer distances. 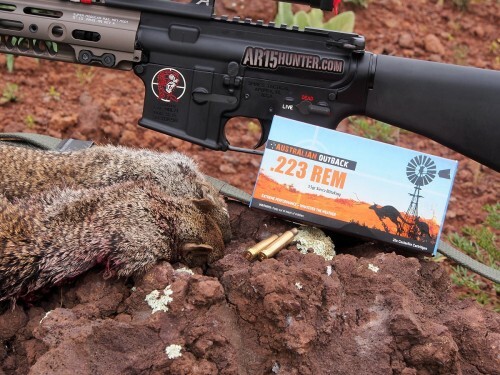 Be sure to watch our accompanying hunt report video, with our Prairie Dog Hunt – Australian Outback Ammo .223 – 55gr BlitzKing on the AR15Hunter’s YouTube channel to see many of the kills mentioned above, and a whole lot more. 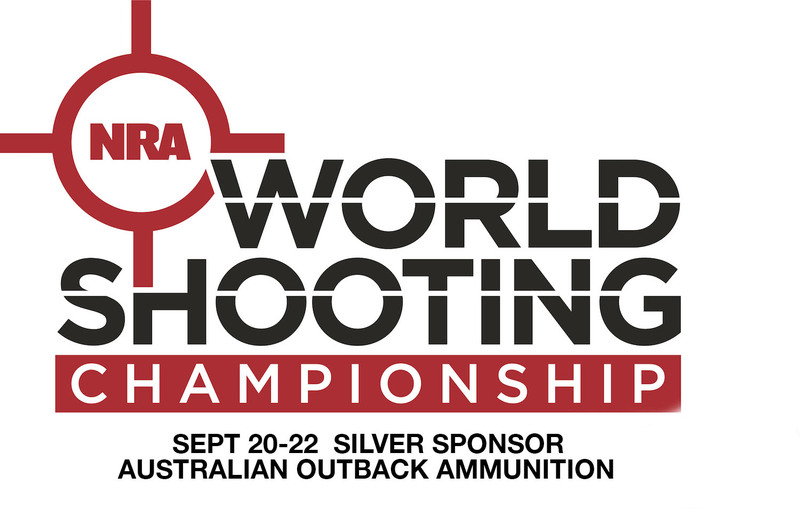 Australian Outback Proud Sponsor of the 2018 NRA World Shooting Championships! Global Ordnance LLC (GO) is pleased to announce their selection as the exclusive Master Distributor of Australian OutBack Ammunition to the United States. A strategic partnership between the AOB importer, Phoenix Defense Group and Global Ordnance has set a foundation for growth that will enable GO to provide quality ammunition to both the Commercial & Defense Markets. Australian OutBack is manufactured by Thales Australia, which trades as Australian Munitions. Australian Outback Ammo Available In The U.S.
Australian Outback Ammo is once again headed to the U.S. In a recovering ammunition and component market in America, the pricing differentials between imported and domestic made product is beginning to level off. Ten shipping containers full of the Aussie cartridges will arrive on the east coast next week and will be available at www.AustralianOutBackammo.com and www.GlobalOrdnance.com. Australian Outback Ammo is designed to resist temperature flunctuations that can effect point of aim, point of impact results. Pricing information will be available soon. Australian Outback provides shooters with the best quality components when assembling their ammunition. The hollow point boat tail design provides that extra margin of ballistic performance match shooters need to fire at long ranges under adverse conditions.